Microsoft is believed to be working on a Surface Pro model which could be a bit thinner and lighter. 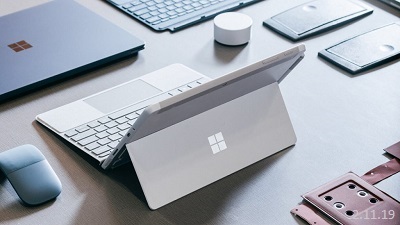 While Microsoft is considering making the Surface slimmer, there is a new patent that brings smart fabrics to Surface tablets, 2-in-1 devices, wearables, handheld devices, and more. In the patent application, Microsoft explains various methods to use sensors to create smart fabrics which could be implemented on Surface hardware, wearables, and other handheld devices. The patent titled ‘FORMING TOUCH SENSOR ON FABRIC’ was applied by Microsoft in July 2017 and published by USPTO on January 24, 2019. With this patent application, Microsoft is looking to bring touch sensors to the fabric material of its hardware. For instance, in the case of a handheld device such as a tablet, the fabric used on the front panel and back surface will have touch sensors. In the detailed description section of the patent, Microsoft says that a touch sensor implemented on the fabric of the device could be configured to work with other sensors. For example, smart fabrics will could be configured to detect swipes or other touch gestures. This may allow users to browse through apps, adjust volume, settings and other functions. It may also allow the device to control another device which is paired wirelessly with the computing device, such as a smartphone. The patent further details a method where users will be allowed to interface with the front touch panel without losing the grip of the device. We have the patent posted on OUR FORUM.